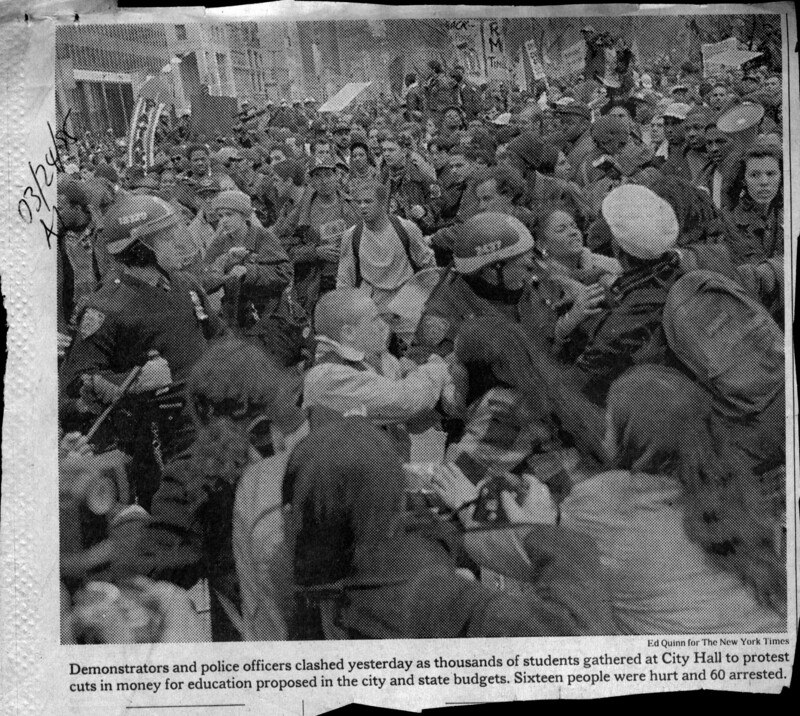 This front-page, above-the-fold New York Times coverage of the CUNY Coalition's March 23, 1995 protest reports that thousands of students walked out of class to protest the proposed state and city budget cuts to CUNY. The article relies mainly on perspectives from police leadership, Mayor Giuliani, and Governor Pataki on the protest, which leaves the reader with a sense that unruly and ungrateful students took the streets to wreak havoc for very little reason. Cite This document | The New York Times, “"Students Leave Classes to Rally Against Budget",” CUNY Digital History Archive, accessed April 18, 2019, http://cdha.cuny.edu/items/show/491.